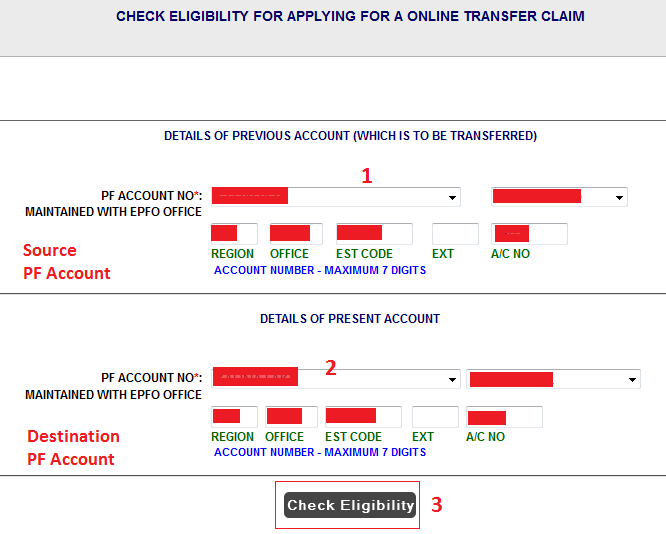 EPFO: How To Check Your Eligibility To Claim Online Transfer Of Employee PF Account Balance? Finance Guru Speaks: You can check for your eligibility to claim online transfer of Previous Employer’s EPF Account Balance to your New Employer’s EPF Account. In order to claim online transfer of PF account balance, yours both the employers should have valid digital signature certificates on EPFO portal. 2. Fill the details of Previous Employer PF Account (Source PF Account), Present Employer PF Account (Destination PF Account), as shown below, and click on Check Eligibility button. Both the previous and present Establishments have valid registered Digital Signature Certificate on the portal. You can forward your claim through any of the establishments. However, In case of attestation by the previous employer, time taken in settlement will be relatively less. Congratulations!! You have successfully checked for your eligibility to claim online transfer of PF account balance from your previous employer to current employer. very useful,handy and written in simple language.. Thanks Pichai for your kind words.